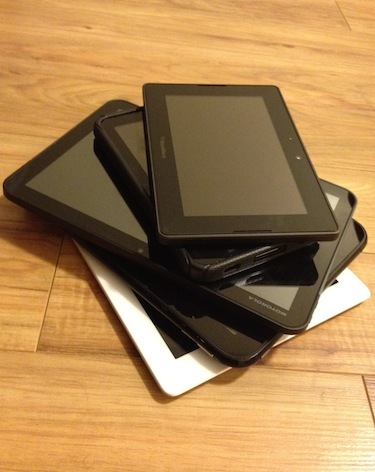 Researchers think 7-inch form factor is too small for a tablet, do you PlayBook owners agree? Is 7 inches too small for a tablet? Steve Jobs seemed to think that the 7-inch tablet was just to small, hence his decision to only release a 10-inch tablet, and now a researcher by the name of Jakob Nielsen has completed a study that he believes confirms this. Having had the BlackBerry PlayBook in hand for quite a while I would personally have to disagree that the 7-inch display is too small, and in fact it is quite nice to carry around, but we wanted to know what you think about it. So PlayBook owners, is the 7-inch form factor to small? Do you find yourself having a hard time navigating around, or are you able to do everything you need without issue? Claiming that 9.7-inch is the ideal size for a tablet, would you PlayBook owners have to agree or disagree with this study? Making use of the bezels, and eliminating the need for physical buttons, and on screen menus to clutter the screen, could his research be off, and the 7-inch size could be ideal for many users? Be sure to share your thoughts on the ideal size in the comments!